Rapidly thawing sea ice in the Arctic Circle has threatened polar wildlife and contributed to global changes in weather and climate. It has also opened the polar region for industrialization and resulted in new shipping lanes and a chance to drill for precious offshore oil reserves. As the NewsHour reports this week on climate change and its impact on the people and businesses along Alaska’s Arctic border, we take a look at how operations in the Arctic by Royal Dutch Shell Oil, the first to drill for oil in the waters near Barrow, Alaska, have been fraught with accidents and controversy. In 2012, the federal Bureau of Safety and Environmental Enforcement granted Shell Oil permission to drill for oil in the Beaufort and Chukchi Seas off of the Alaskan coast, the first in 20 years, reported CNN Money. According to the New York Times, the company originally intended to drill 10 wells and started its operations last year with two drilling rigs: the Kulluk and the Noble Discoverer. The Obama administration granted Shell drilling rights on the condition that the company include underwater safeguards to prevent a disaster like the BP Deepwater Horizon spill in 2010. Shell spent approximately $4.5 billion for permits, equipment and an extensive campaign over six years to explore the Arctic for oil, the New York Times reported. July 2012– Shell Oil’s Noble Discoverer drill ship drags anchor and nearly drifts ashore in Dutch Harbor, Alaska. September 2012 – Caught off guard by sea ice, Shell is forced to halt drilling – just one day after it started. October 2012 – The CEO of French oil giant Total says drilling in the Arctic is too risky. November 2012 – Noble Discoverer catches fire. Despite national fears of another offshore oil spill, Shell Alaska vice president Peter Slaiby assured the public that the company had learned from the Deepwater Horizon accident. announced that Shell will not be allowed to drill in the Alaskan Arctic without improved safety measures. “Shell screwed up in 2012, and we’re not going to let them screw up when they try to drill in the Arctic again,” Salazar said when the department released its report. Read the U.S. Department of Interior report here. Greenpeace activists in Germany hold signs protesting Shell’s Arctic oil drilling expeditions July 2013. Photo by Greenpeace. 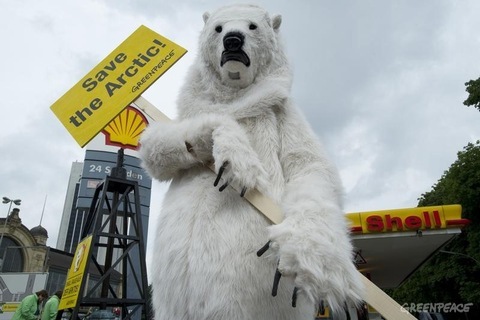 Environmental activist organizations like Greenpeace escalated their protests against further drilling by starting the Save the Arctic campaign and collecting signatures to declare the region a global sanctuary. Ten conservation organizations — Alaska Wilderness League, Center for Biological Diversity, Greenpeace, National Audubon Society, Natural Resources Defense Council, Ocean Conservancy, Oceana, Pacific Environment, Resisting Environmental Destruction on Indigenous Lands, and Sierra Club — filed a lawsuit against the Bureau of Safety and Environmental Enforcement for allowing Shell to drill for oil without a prior assessment under the National Environmental Policy Act. U.S. District Court Judge Beistline ruled against them on August 5. The Environmental Protection Agency fined Shell $1.1 million for violations to the Clean Air Act. Noble Discoverer and the Kulluk’s engines released nitrogen oxide, ammonia and other pollutants in excess of what permits allowed. The EPA cited 23 violations of the air permits governing the Discoverer and 11 for the Kulluk, reported the energy blog Fuel Fix. Shell Oil president Marvin Odum defended the company’s exploration in the Arctic in January.